Editor's Note: The 2013 Major League Soccer season is underway! You've read your season predictions, team-by-team capsules, and all sorts of talk on the state of American soccer. Season eighteen is an important benchmark as it passes the seventeen that the last attempt at professional soccer, the North American Soccer League (version 1.0), in the U.S. survived for. And while you might be celebrating your side's first victory or scratching your head over their first lost... there's one thing that's been missing from all these early MLS musings... beer. A fairly active offseason has given New Englanders reason to be cautiously optimistic. Recent acquisitions Andrew Farrell and Donnie Smith, as well as homegrown product Scott Caldwell all put in very promising shifts during the preseason. Revs fans will also keep an eye on the young Diego Fagundez, who is poised for a breakout year (in terms of goals and possibly dermatologically speaking—he is still in high school, after all). Saer Sene, Jerry “Springer” Bengston, Juan Toja, Lee Nguyen, and Stephen McCarthy are other standouts on a surprising talented squad. Since Benny Feilhaber’s departure early in the offseason, Lee Nguyen has become the team’s marquee player. Arguably the most skillful, technically gifted member of the squad, the Revs will need him to have a great year if it hopes to make it into the postseason. Heading into his sophomore year as head coach, Jay Heaps will hope to emulate the success his peers Ben Olsen and Jason Kreis had in their second years. “This year will be different.” Being a New England fan is about keeping the faith in the face of hard times. 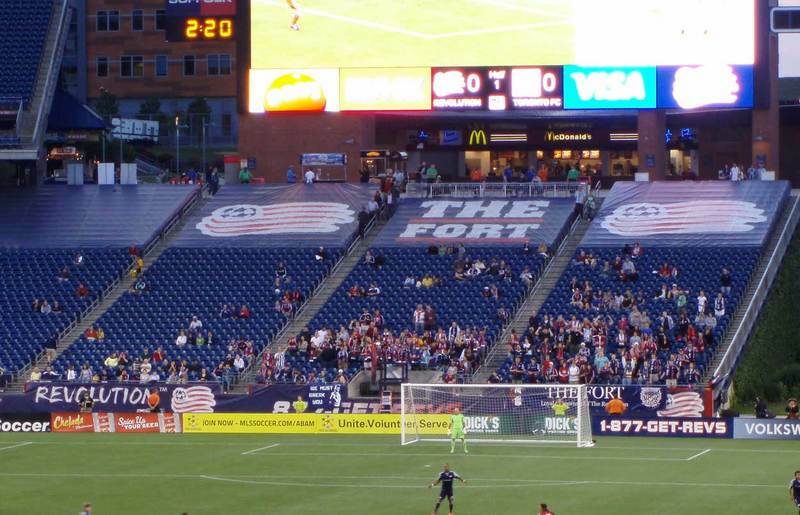 Even without a big name signing or a soccer-specific stadium in sight, Revs supporters have the audacity to dream big. 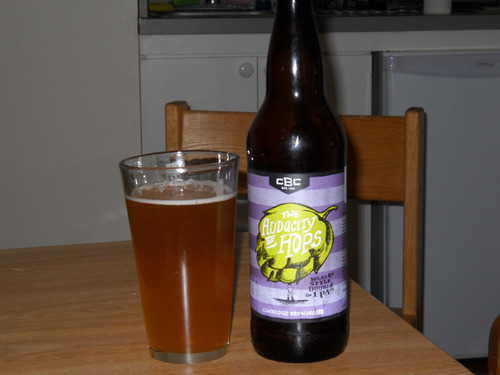 The Audacity of Hops is an audaciously hopped Belgian Double IPA with an ABV of 9% and 70 IBUs. A meld of the quintessentially American flavors of a west coast IPA and the spicy complexities of a Belgian, the beer is a marriage of New and Old World tastes. Pair with a sharp, aged cheddar from Vermont. This week's edition of the series is a special one as we're featuring TWO supporters group of one MLS club. It's always a treat to go to the movies and get a double feature and we're hoping that you'll feel the same way about getting double the info on New England's supporters groups. First up, the Midnight Riders as told to the Free Beer Movement by MR executive board member Chris Camille. You can read all about the Rebellion, the Revolution's other major SG as well. Year SG Founded: 1995, the year before MLS began. Location of SG in Stadium (section #, side, direction): Section 143, in the shadow of the "light house." Everyone should take a second and be thankful for Paul Revere and his famous "Midnight Ride," if it wasn't for him Tim Howard would have been in net this past summer for England and we wouldn't have been able to see Robert Green's famous flub. Further, Canada would probably have made a few more World Cups at this point, and really, who wants that? Look it up in your alternate-history books, kids. It's all right there. Cheering on the ultimate Fort Favorite, Khano Smith with "Kaaahno, no, no, no, no…" to the tune of "Seven Nation Army." In cavernous Gillette Stadium the Fort is the only place where you can stand and feel like you are actually part of something. Everyone is always packed in to this tiny little outpost in what is most likely the worst part of the stadium to actually view the action on the field. This, coupled with the horrible 45+ minutes a majority of our members need to drive to reach Gillette from Boston and you know that everyone is there because they are obsessed with the sport and with the Revs in general. We've heard a million excuses about why it isn't worth the trip but it doesn't matter, we're all there no matter what to support the team. Just ask Atlante's keeper Frederico Vilar about his time in front of the Fort during the SuperLiga and he'll tell you that on our day we can support with the best of them. We are the largest supporters group of the New England Revolution. We represent more states than any other SG out there. All six of the New England states have representation. We also have about as long a history as you can have in supporting MLS. The group has existed since 1995, a year before actual play began. We started the Fort with the Rev Army and we were also one of the first groups to incorporate "tifo" displays into our game day repertoire. I also think we have one of the best tailgates you can be a part of. We may at first seem like ornery bunch but just like any New Englander, once you get to know us, we're actually very friendly. Some supporters groups out there who have watched Green Street Hooligans a bit too much won't think this is bragging but I also think we are the most friendly supporters group in the country. There is always an open invitation that if you are traveling to Foxboro to watch your team take on the Revs you should swing by our tailgate to grab a bite to eat and try some of our top-notch craft beers (to rival those from anywhere in the country, though this topic may be for another blog post). We've had a pretty tumultuous history in terms of results but there have certainly been some pretty incredible highlights. In 2002, when we hosted the MLS Cup Final and the Revs played in front of 68,000 fans (still an MLS Cup record for attendance) is certainly up there despite the soul crushing final play. The other two results that resonate with most of our members are the two times we have actually lived the silverware. In 2007 the Revs won the US Open Cup and a large group of Riders were there to cheer on the cause. In 2008, in front of a packed Fort, the Revs were able to get a bit of solace after their losses to the Dyanmo in the MLS Cup Finals by defeating Houston in penalties. The Revs were horrendous last season so it is nice to see that they realized something had to be done. It is still to be seen if what they did is going to make a difference. The team has added a lot of young, inexperienced players and a lot of older veterans. If they can get the balance right they could do okay but there is always the chance that the older guys will get hurt and the younger ones won't be ready to step in. Rookie Ryan Kinne could be the surprise package of the season so watch this space! We all love the game for one reason or another and supporting your local club is just too important to the future of the game in this country not to do. Our stadium is very far away from Boston where quite a few of our members actually live. Everyone has a story of some fan who only supports a European club at a bar and doesn't see value in supporting his or her local side and it is one of the most frustrating things to encounter when you are trying to build support. They often say that the quality of the MLS isn't up to par with what they're watching at 7:30 am at the pub and we're am not trying to argue with that. We are saying that the only way that the team that you can actually watch live, week in and week out, is going to get better is with the support of any and all local fans of the game. For more information and/or to join the Midnight Riders check out their website. Second up, the Rebellion as told to the Free Beer Movement by Bill Lewandowski, Rebellion Propaganda Minister. You can read all about the Midnight Riders, the Revolution's other major SG as well. Origins of the group name are derived from the American Revolution theme. The New England colonies had become the most dissident of the 13 and pushed the line from simple defiance of the crown to outright Rebellion. Early Rebels formed a tight network to combat the British, organizing the common defense and coordinating throughout New England to collectively rise up for a common cause. This couldn't reign more true with our goals in the saturated sports market of Boston. You can just sit back in your seats and wait for something to happen or you can stand up, shoulder to shoulder with your friends and create the atmosphere, the passion, and inspire your team and will them to victory or go hoarse trying. Whether we're displaying tifo, singing our hearts out, waving flags, or drinking confetti filled beers you're a part of a constant build up to a possible explosion of emotion. It's addicting. We're new, and we may not be the "best" but I do know what sets us apart. Inclusion. We made it our mission the show the casual soccer fan the benefits of seeing the game from our angle; and how much fun living the supporters lifestyle can be. There is a tight knit family created by this that extends far beyond Revs games. A culturally diverse area like New England brings together passionate fans with multiple backgrounds with a high soccer IQ and a deep appreciate for the game. Together we collectively share a goal; to spread and elevate the game in this country. That all starts in the Fort on game day. In addition the majority of our members make up some of the best American Outlaw chapters in the country. @AO_Providence , @AOBoston and AO Hartford. AO Boston known for making the legendary trip to Honduras, and AO Providence having one of the best Donovan goal celebrations out there. 2008 Superliga Finals. After a hotly contested Semi Final win over Atlante featuring a total of six red cards, the Revs faced Houston Dynamo at Gillette. Houston had ousted us in the previous two MLS Cups. Bad blood galore. After falling to 1-0, a Steve Ralston goal tied it at 1-1 and the game eventually went into extra time. Revs fell quickly 2-1 in the OT period until Shalrie Joseph's header knotted it back up 2-2 to send the game to PKs to which the Revs won 6-5. Epic. Amazing. Awesome. Undefeated, winning MLS Cup, dominating US Open Cup, embarrassing any European club who makes the trip and being overly jingoistic about supporting our Boys. This is our league in our country. The argument is made that it's not the among the top leagues in the world and our best Americans play abroad. It's no excuse not to support your local club. For example, the best Argentineans play abroad, and have you seen a River Plate v Boca Juniors game? Bananas. Our players that move on are forever MLS players. Clint Dempsey will always be a Rev. It's awesome to be able to look back and say you saw a future superstar develop in front of you. Why soccer in America? Frankly can anyone stomach the amount of commercials during an American Football game? Can you really suffer through four hour baseball games 162 times? An MLS fan has more in common with an MLS player in terms of compensation and living conditions than other sport in America. These guys play for the love of the game. For more information and/or to join the Rebellion check out their website.